Bubble Tanks 2 is a great sequel to one of our favorite shooting games. The goal is to make the perfect bubble tank you can. 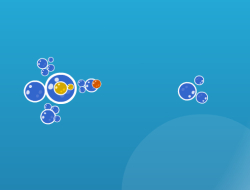 To do this you need to shoot down the other bubbles and then collect their left over blue bubbles to add them to your tank. As you collect you will increase your experience bar and when you fill it up you will get to choose one of the three paths for your tank. Either go fighter mode to get some nice weapons and agility, more of the tank to get lower damage but increased resistance or somewhere in between to get a bit of both. Use the WASD keys to move and the mouse to aim and fire. Bubble Tanks 2 0.00 between 0 and 10 based on 0 votes.